City Council members C. Arvilla Hunt (from left), David C. Collins and Joseph Hamrick are among those who have condemned the city’s wasteful spending. Questions outnumbered answers at last night’s City Council meeting – itself a source of confusion. Although the session had been described as a special meeting on the city’s budget crisis – which would have permitted voting and public comment – it was advertised as a workshop, precluding a vote on transferring more than $2 million from the city’s trust fund to meet spiraling expenses. That vote is expected Monday night. Marcarelli said the city came up $225,000 short in fine and permit fees, and that the city fell behind in its minimum municipal obligation (MMO) for pensions. He said $506,000 was paid for 2011, but another $503,000 is due before the end of 2012. He estimated an additional $75,000 will be needed for various legal costs before the end of the year. 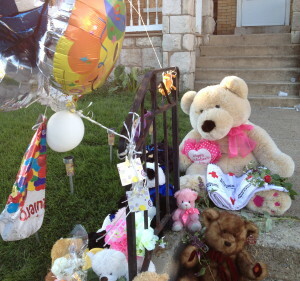 A memorial of balloons and stuffed animals sits outside the home in the 500 block of East Chestnut Street, where a mother and son died in a fire on Tuesday. According to city records obtained through a Right-to-Know request, the city budgeted $300,000 in legal costs for 2012, a figure it had exceeded by nearly $123,000 at the end of July. Hamrick said his fear about taking money from the trust fund was that it had become an annual occurrence and that the amount Marcarelli requested might increase again. In August, Marcarelli said the city needed nearly $2 million, a figure he raised to $2.25 million earlier this month after a $275,000 lawsuit settlement. “Is this just wishful thinking?” Hamrick asked. Marcarelli expressed confidence in the projected numbers, “barring another settlement.” However, one police lawsuit remains unresolved, another is promised, and a third is threatening, according to attorneys. Collins presented a document that reportedly showed some police officers had purchased iPhones as recently as last month with their $450 uniform allowance. He said the expense is not allowed under the contract, especially because the force receives city-issued phones. Asked about the source of the document, he declined to reveal it. Councilwoman C. Arvilla Hunt demanded to know who authorized the purchases, but no one knew who was in charge of the department at that time, let alone who might have signed off on the phones. City records show that Interim Police Chief James Bell was in charge for at least some of the questionable expenditures. Hunt, a vocal supporter of Bell, was the lone dissenter in a 3-1 vote on Sept. 10 to hire Maj. John “Jack” W. Laufer III, a veteran of the state police, to head the department permanently. Because only four members of the seven-member council were present, the vote failed. At the conclusion of the often-contentious 3 1/2-hour meeting, Laufer removed his name from consideration. Last night, with all members present, Collins defended Hunt’s actions, which he said were based on the city’s unstable finances. He said anger about the vote should be directed at the council members who weren’t present. Anger from residents about the city’s budget crisis was directed to council as a whole. 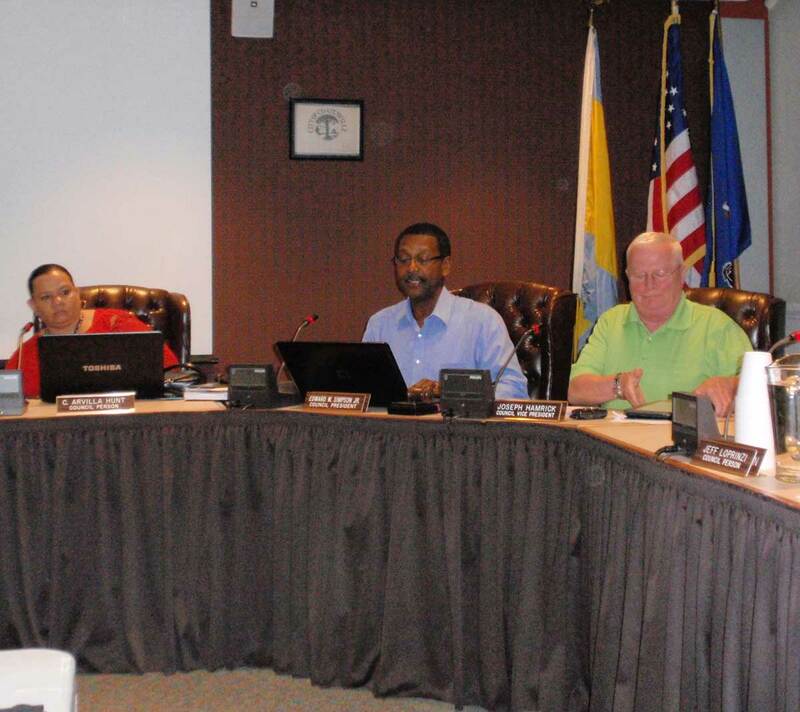 Although workshops typically do not involve public comment, council agreed to permit citizens to speak briefly due to the confusion about the meeting. Hanna suggested that Coatesville was headed in the direction of imperiled cities like Harrisburg and Camden. “This council better get with it; you’re going over budget every year,” he said, citing $47,000 for redevelopment that didn’t occur. Darrell Williams expressed frustration that with skyrocketing police expenses, at least two officers are being paid to stay home. An investigation into an alleged affair between Officer Amy W. Nicholl and Lt. Chris McEvoy, both of whom are on leave, mushroomed into a criminal probe targeting their investigators. Attorneys for Nicholl and McEvoy have said repeatedly that their clients want to return to work. Williams said the pair should have been reassigned. “They need to be here doing something … They shouldn’t be getting a free ride,” he said. After the meeting, City Manager Kirby Hudson, who has said the police department would benefit greatly from Laufer’s leadership, said many council members had urged him to reach out to Laufer in hopes of getting him to change his mind. Hudson said he has already received a letter from the FOP supporting Laufer and expected to get similar letters from individual council members today. Hudson said he hoped Laufer would agree to meet with him and an FOP representative on Friday so they could hand-deliver the letters and express the city’s plea for his reconsideration. Before the meeting, city firefighters canvassed the neighborhood where a fast-moving house fire on Tuesday claimed the lives of a mother and son, who were unable to escape from a second-floor bedroom. A makeshift memorial of balloons and stuffed animals sits in front of the home in the 500 block of East Chestnut Street. Acting Fire Chief Jim Lentz said about a dozen free smoke-detectors were installed yesterday and another dozen batteries were replaced. Lentz said a working smoke detector might have saved the lives of Elizabeth Izquierdo, 44, and her son, Imanol. Linda and Mike I think you don’t understand the law enforcement mentality. Coatesville had a so called strong police Chief in Julius Canale. Then what happened several lawsuits. All the lawsuits were under the Canale administration. Now they have Chief Bell and everyone is mentioning the lawsuits. You need to place the blame on the guilty person. Chief Canale had every lawsuit filed on his watch not Chief Bell. Chief Canale was incompetent, uneducated, and now being investigated by the Attorney General for criminal acts. He is the reason why the lawsuits have been filed. Please do your research!!! History is repeating itself. How can the people on City Council and the citizens of Coatesville sit back and watch this happen? The faces have changed but the game is still the same. How can you expect to have a better City with this low life mentality. I think Council is hindering rather than helping. WE NEED A STRONG POLICE FORCE AND A STRONG CITY GOVERNMENT to get back on the winning track. I resent my tax dollars going to lawyers. Our tax dollars have zero dollars budgeted for improvements. Why? Because we spend all the money on lawsuits. Maybe if we had a strong Police Chief that is not a puppet of the City Manager and City Council, we might have a chance to turn this City around. I think everyone is missing the real issues here. City council approved the buyouts to save money when the Police Union knew that 5 of the people retiring officers we’re being investigated by the Attorney General Office. The council was deceived by the Police Union and they admitted it. The city is paying overtime but that’s just because a lot of officers will not pull their own weight. Last but not least the cell phone issue is an issue of integrity. It show be investigated. Yes investigated thoroughly. The litigation cause is because the last extremely incompetent Chief was no qualified for the position. He violated rights, labor laws, and made things up as he went along. Keep in mind that the early retirement fiasco was an effort to have a smaller PD. If Lt. Laufer comes to Coatesville he will be the chief of a smaller police department. Some officers have had enough and are going elsewhere. Collins can have his balanced budget when they go. A lot of people that I saw in the City Hall meeting room were drug dealers rooting for the old days when drug dealers ruled the streets of Coatesville. Some of those people at the City Council meetings are doing time right now. Wether or not we have a competent chief we are going to have a smaller less effective reactive PD. The drug dealers might be cheering on city council for gutting the PD. But they might not like Tom Hogan’s response to the city council’s gutting of the Coatesville PD. Tom brings what you might call an invading army of State Troopers, Chester County Detectives and other local police to Coatesville from time to time. Really, they are focusing on phones, not the fact that there was so much money sent on litigation? And don’t forget all the money spent on the early retirement packages that were supposed to help save money. All that did was increase OT costs. I pray they can get Laufer to reconsider. The police department needs a strong leader! God help the city if this continues! Yes, David you are right, but will you take the steps that are necessary to stop it? It’s odd that the two areas Mr. Marcarelli states are short $225,000 (fines & permit fees) are two of the revenue streams that don’t have paperwork that’s attached to the revenues when they come into the finance department. There isn’t a direct correlation between what is due, and paperwork submitted in the department. It’s curious that these two revenue streams are light. I wonder if Mr. Collins can tweak some of the processes to make the receivables, receivable.